Who Has the Best Scones in NYC? I’m really going with the whole theme of “who’s got the best of…(some type of food)?” Can’t help it really. If I’m craving for a certain type of food heck, I’ll search the ends of New York City, to get it and possibly pay for that certain price tag. So, it’s all about scones today. I love a good scone, especially the ones just out the oven, I would be in heaven. Unfortunately, the academic life restricts my schedule from actually bake scones and amongst a ton of other things. Seriously, I’m in dire need to bake just to take out the stress of life. 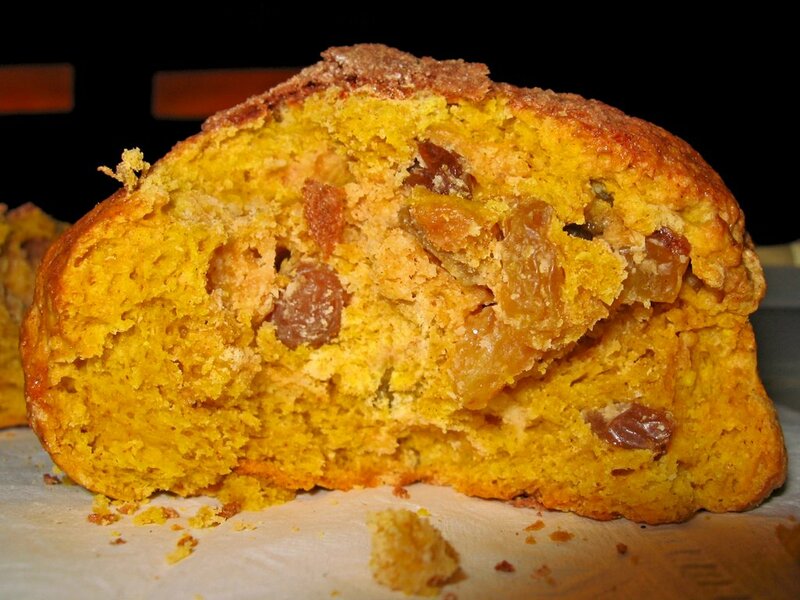 Anyways, those of you who don’t really know what a scone is, it’s a Scottish quick bread is said to have taken its name from the Stone of Destiny (or Scone), the place where Scottish kings were once crowned. They come in various shapes including triangles, rounds, squares and diamonds. 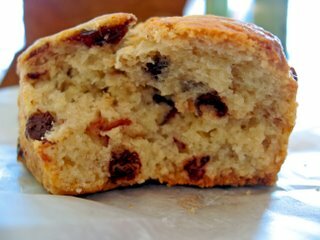 Scones can be savory or sweet and are usually eaten for breakfast or tea (from Foodtv.com). If you still haven’t gotten the idea of what the heck a scone is, think of American biscuits that could have different flavor variations, either sweet or savory. Got it now? Good. Since I can’t bake, I buy and hope to search for a good or possibly great scone. I tried bakeries to the organic bakers who are part of the Union Square Greenmarket. Not suprisingly, I’ve eaten the good and the ugly. My ideal scone would have a beautiful, golden brown exterior that is slightly crisp or crunchy and a soft, flaky slightly moist center. I don’t really care what flavor the scone is. It can be sweet or savory, as long as the flavors don’t overpower the scone or the other flavorings – I seek balance and contrast in textures and flavors. So, onto the scones! The rating system will go from 1-4 (Same as the croissants). I’ll begin with Financier Patisserie’s fruit & nut scone. 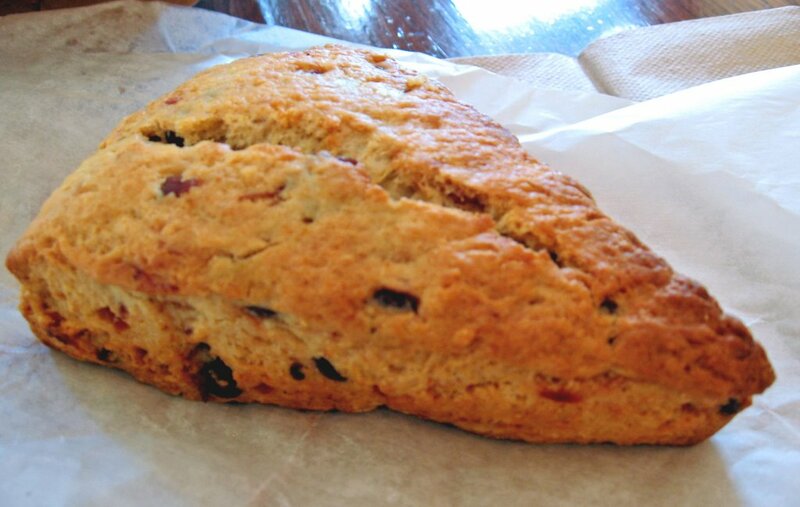 It looks like a traditional scone, the type that one would roll out a large thick sheet of scone dough and cut it out with a cookie cutter. It’s glazed with heavy cream by the sheen and that’s the traditional way of baking a scone. 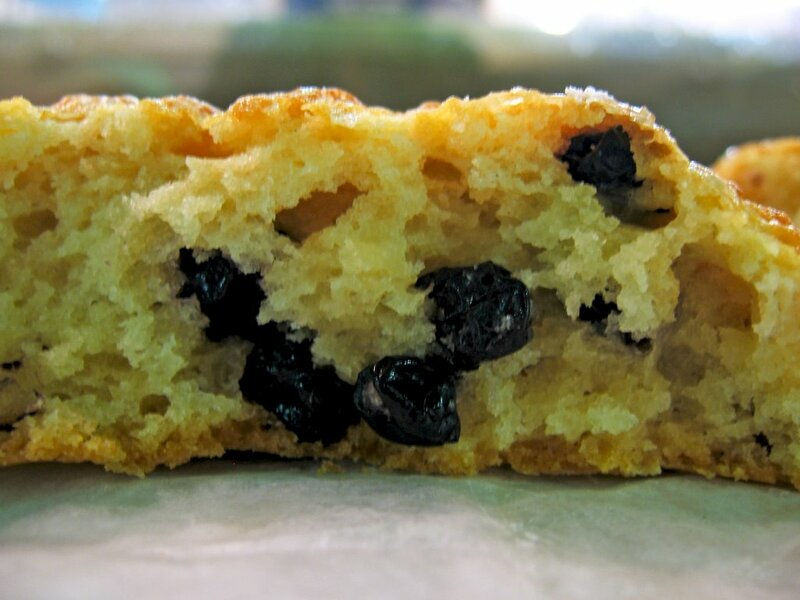 It has a nice golden brown color and it looks like there’s a good bit of raisins too. The interior is moist, good crumb composition, and a good amount of raisins and almond slivers. 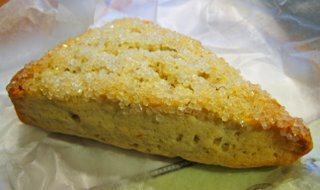 There’s a slight hint of almond flavor which makes this scone a bit appealing to my tastebuds also it’s not too sweet. It’s good, not spectacularly great. Rating: 3 out of 4. Joyce’s Bakeshop‘s cherry chocolate scone ($2.50) has a good amount of miniature chocolate chips dotted on the surface. The scone is a lot drier than Financier’s. It actually has the dry, crumbly texture of a shortbread than a scone. It does have chocolate flavor but it’s mediocre chocolate. There are a couple of chopped dried cherries, as seen in the photo, but I don’t really taste them. I think they should use dried tart cherries than bings so the cherry flavor could shine through instead of being virtually nonexistent in the taste, but at least it has good butter flavor and it’s not too sweet. Rating: 2.75 out of 4. 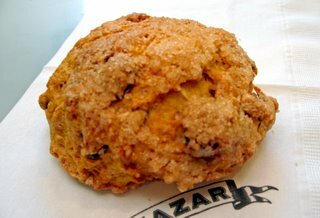 Balthazar Bakery‘s pumpkin-fruit scone ($2.50); the name explains the yellow-orange hue to the scone and it’s sugar crusted. There’s dried raisins and cherries in it, the latter was kind of unexpected to me since I ususally assumed that they would just have raisins but the more (fruits), the merrier. 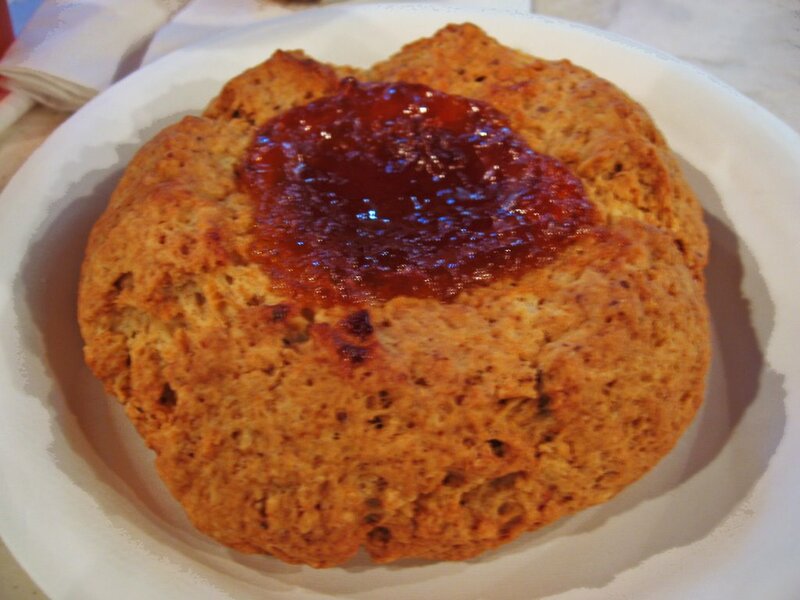 The texture is more biscuit/scone-like: Crisp exterior, soft, somewhat moist, interior. It has a great pumpkin flavor that isn’t overpowered by the cloves or nutmeg but I can taste the presence of the spices. It’s a good balance of sweet and spice. Rating: 3.1 out of 4. 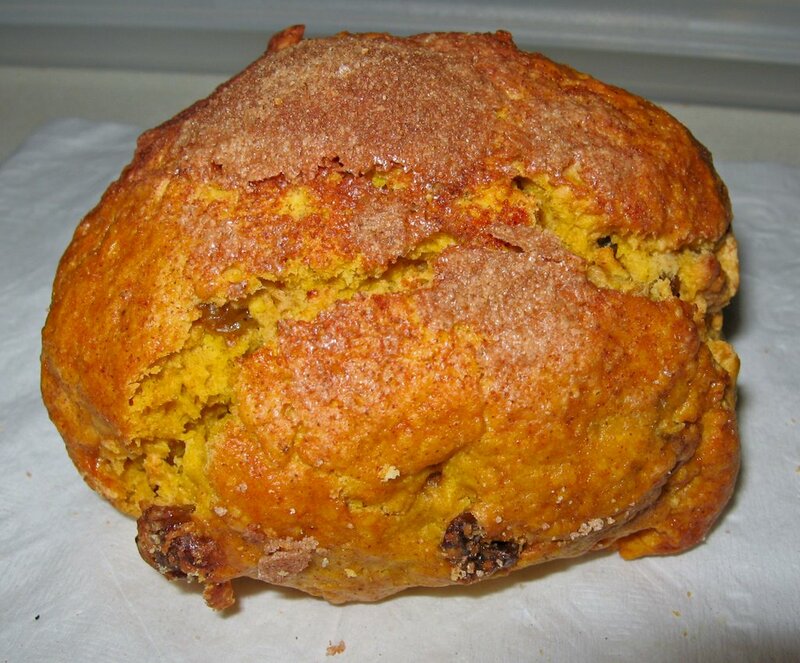 This pumpkin and raisin scone is from Our Daily Bread, one of those baked goods stands from the Union Square Greenmarket. 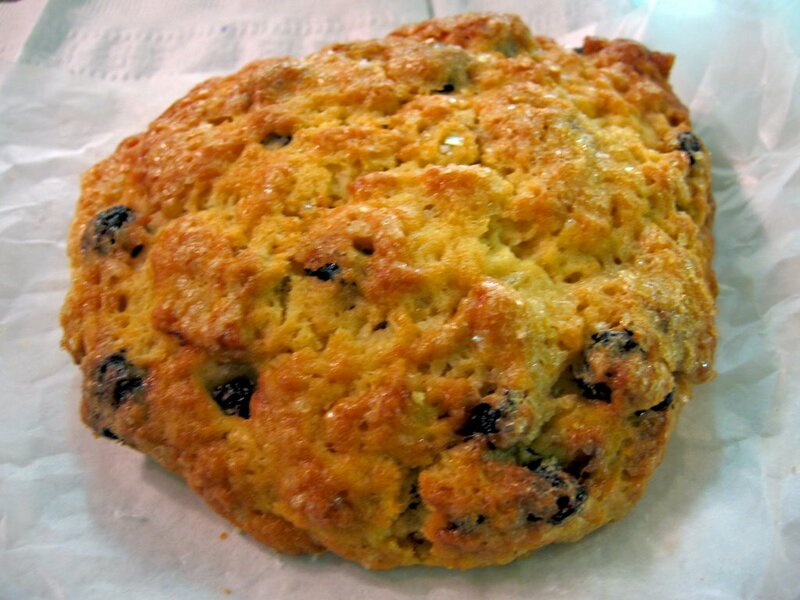 The scone looks humble and simple with a sugar crust and lots of raisins dotted throughout the scone. The exterior crust is crisp and crunchy from the sugar crust. 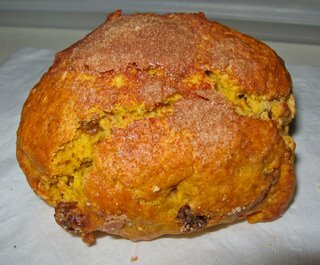 It has a good pumpkin flavor with a nice spicy background from the spices; not overpowering. 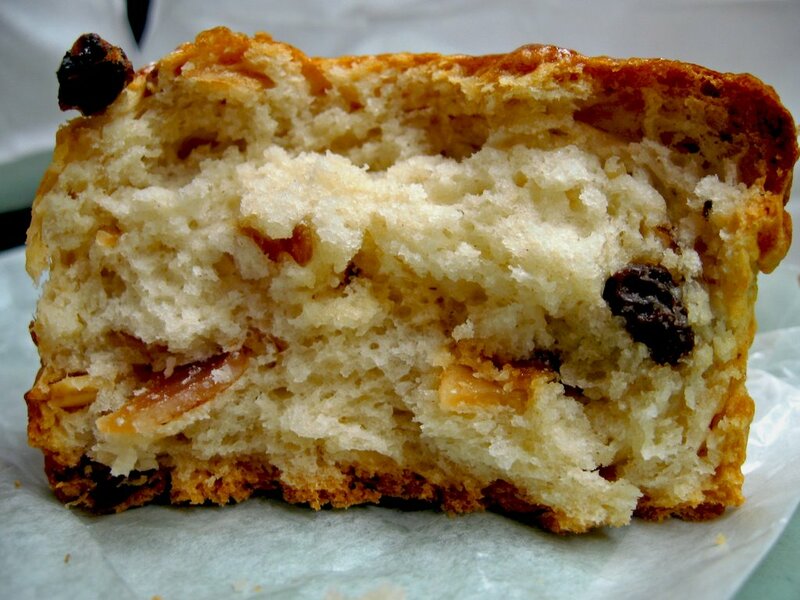 The interior is moist but not mushy with lots of green raisins in the scone. Rating: 3 out of 4. 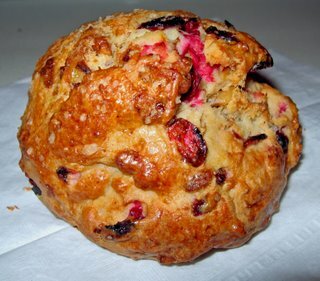 Another Greenmarket stand, Bread Alone‘s cranberry scone ($1.75) looks visually appealing, comparing to it’s competition/peer, Our Daily Bread. It has a more desirable golden brown exterior with the bright red color from the cranberry’s juices bursting while the scone baked in the oven. The crust was not as crisp as Our Daily’s. 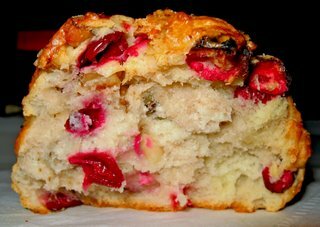 The interior crumb was very moist – nearing mushy, and you can see the vast amount of cranberries dotted in the scone and a few walnuts. The major problem with this scone is that it is bland! 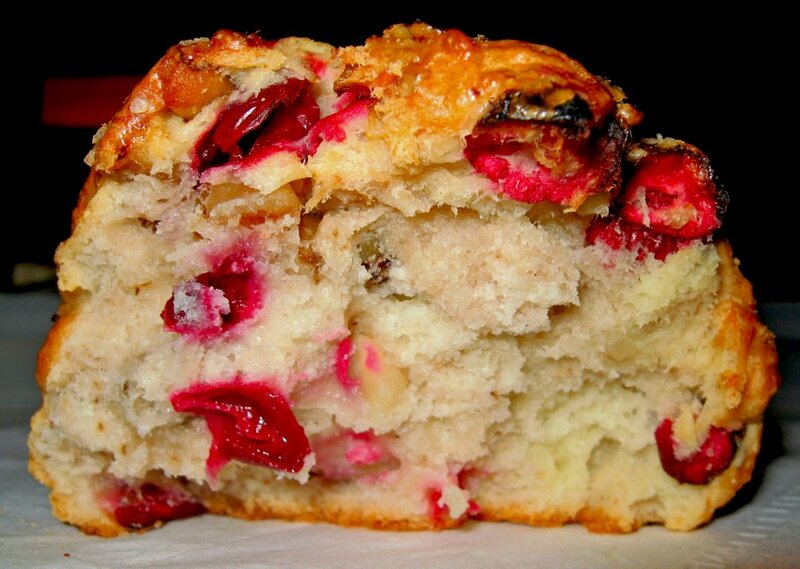 No buttery flavor, no sweetness from the dough; the cranberry doesn’t contribute much to the flavor either. The only thing I tasted in this scone was a hint of nuttiness from biting on the walnut and a nearly negligible sour-tartness from the cranberry. Not a good scone at all. I actually threw it out after two small bites from this thing. Rating: 1 out of 4. Bouchon Bakery‘s plain scone ($2.50) had a nice sugary crust with a pale golden hue. It’s not greasy and it had a nice crunch from the sugary exterior. I had high expectations for this scone just because it’s from Bouchon. 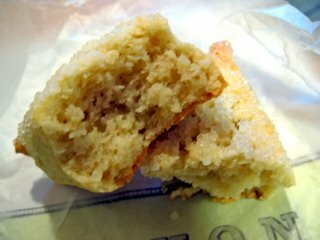 However, this scone is *gasp* nearly bland; it just has a weak butter flavor and somehow I tasted a faint, annoying raw flour aftertaste everytime I bite into it. Rating: 2.5 out of 4. 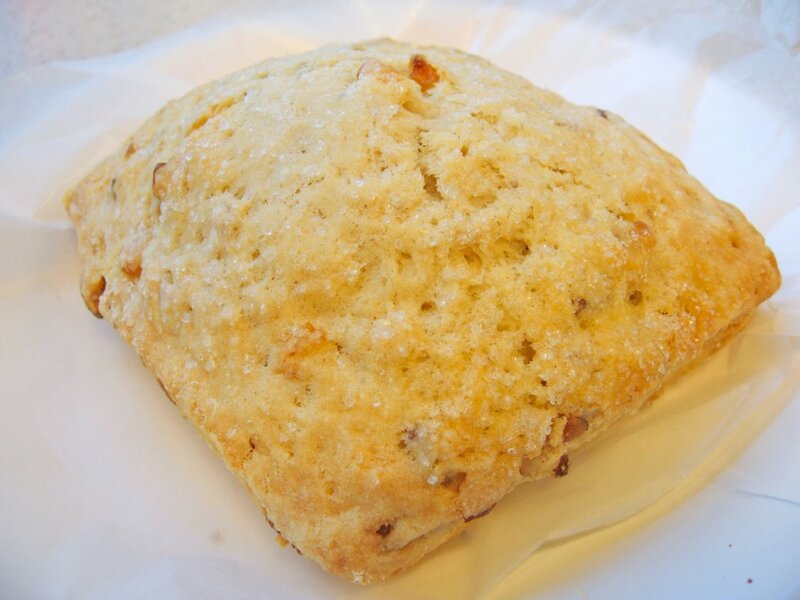 Once Upon A Tart‘s apricot walnut scone ($2.50) does not look like a traditional scone at all. I didn’t pay attention to how it looked since I just looked at the list of offerings available that day and I was surprised that it looks like a jumbo thumbprint cookie. 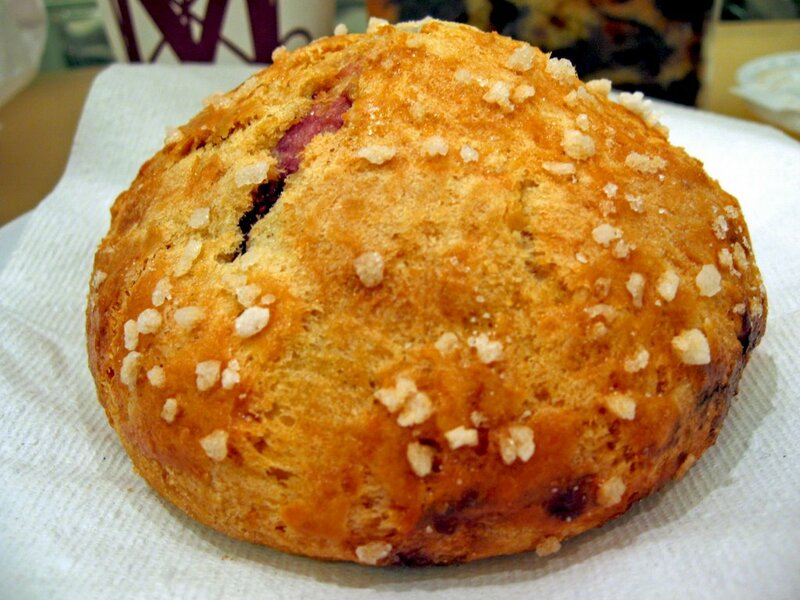 After that intial shock of sorts, I started analyzing this scone. It was barely warm when I touched and ate this scone; about 8 AM. 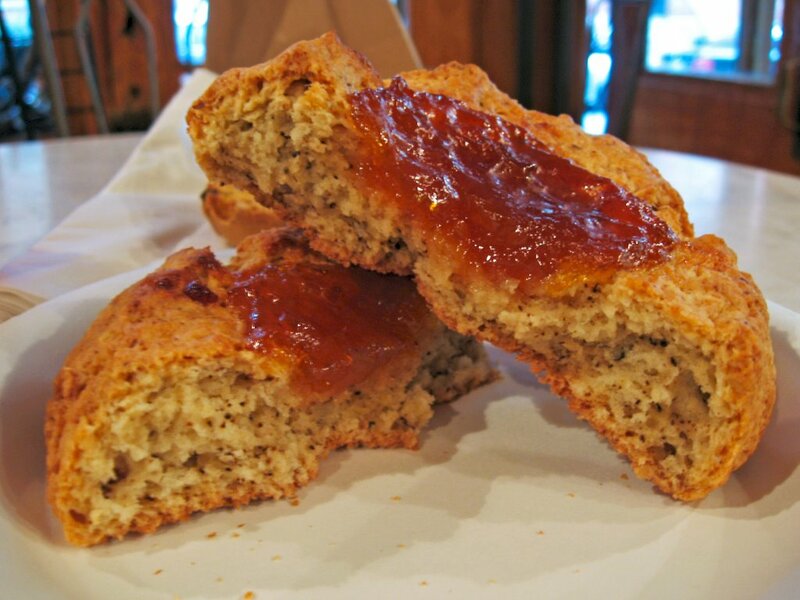 It has a nutty aroma due to the fact this scone was made of walnut flour and the apricot was the jam in the center. Not what I particularly had in mind either. I was actually thinking of a scone mixed with walnuts and chopped dried apricots. It had a slightly crisp exterior and a moist interior. 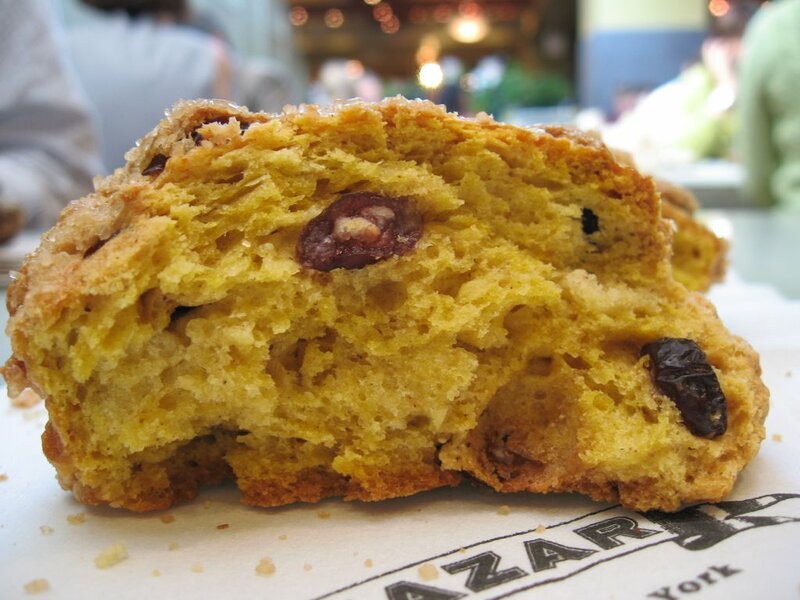 The scone’s nutty earthiness contrasted with the apricot’s bright, sweet-tart flavor. It was unexpectedly good. Rating: 3.2 out of 4. Amy’s Bread blueberry scone ($2.25) it’s covered with lots of tiny blueberries, a golden brown hue with a sugar crust on top. It tastes as good as it looks. The scone was crunchy on the edges, sweet but not overly sweet, some buttery flavor, and a good amount of berries throughout the scone. 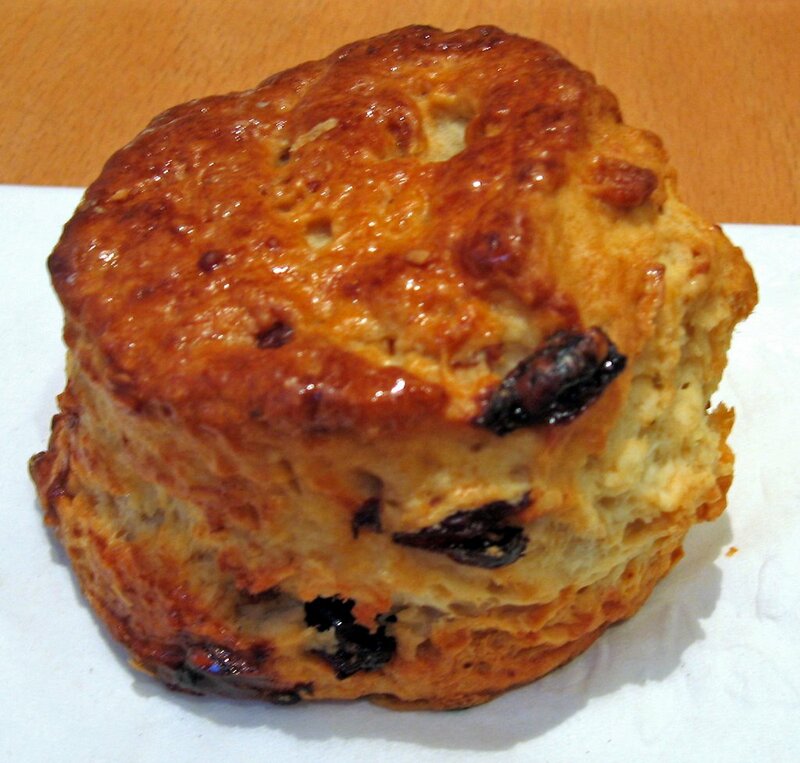 To get a sense of what the texture of the scone looks like, take a look at its closeup. I like this scone a lot. Rating: 3.5 out of 4. Whole Foods‘s blueberry scone ($1.69). Yes, I tried their stuff, too. I did it out of impulse and my craving for scones. I didn’t expect much from their scones just because it’s a supermarket, not a bakery. 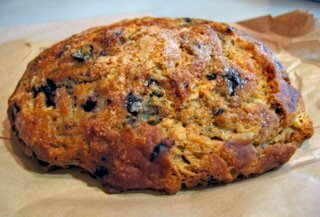 It looked like it had a lot of blueberries from all of the blue-gray spotts throughout the surface of the scone and it had a golden brown exterior. Looks decent. But does it taste good? Well, not really. It’s pretty much bland. I only could taste the tartness of the blueberries but there’s no real oomph of blueberry flavor; just a hint of butter and a faint sweet cream flavor. Rating: 2.2 out of 4. Zabar’s apricot scone ($1.60) looks a bit pallid for a scone. It looks disappointing. The scone is soft but only crisp on the edges. There’s a good bit of apricots and a little bit of scattered in the scone. 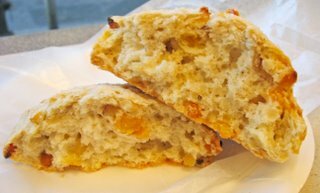 It has a slight nutty, almondy taste, no real apricot flavor found in this scone. It’s not a good scone but at least their coffee’s decent. Rating: 1.5 out of 4. Eli Zabar, not to get confused with Zabar, this is an expensive, upscale food store in the Upper East Side, not the Upper West. 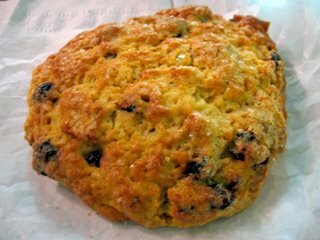 Eli Zabar’s blueberry scone ($2.50) looked appetizing and it smelled like butter. Positive signs after eating so many mediocre scones. It had a sugar crust and just a vein of blueberry juice on the surface. 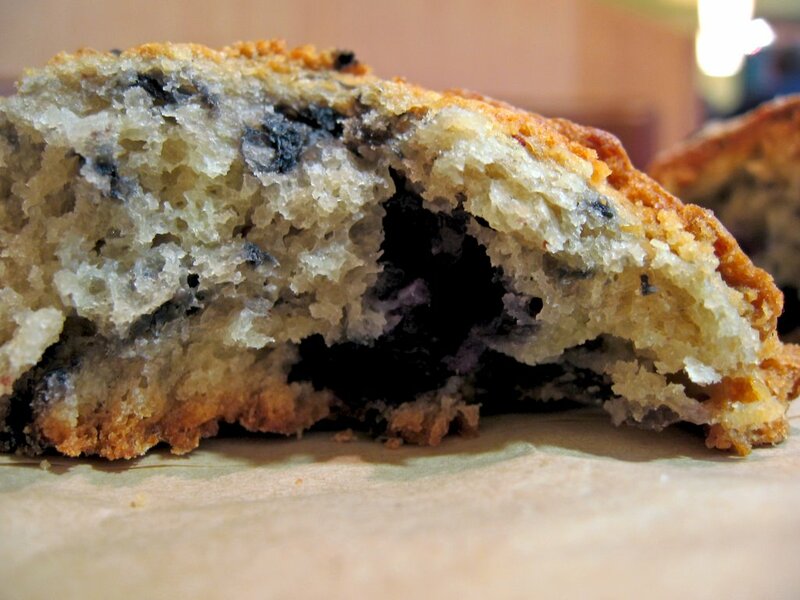 I hoped that this blueberry scone had more than just a few blueberries. However, my hopes were dashed once I broke it apart. It just have those few veins and everything else was plain. At least it was slightly crisp on the outside and a soft, moist crumb. It tasted like a sweet, plain scone with a good butter flavor with a very etheral hint of vanilla. Not much of blueberry flavor to speak of, obviously after seeing that photo you can tell. Rating: 2.8 out of 4. It tastes good but it lacked the blueberries I paid for! reenmarkets on Mondays, Wednesdays & Fridays. Union Square Greenmarket on Mon, Wed., & Fri. I love your “Who Has the Best” series. Could you find the best muffins, cake doughnuts and rugelach please? I haven’t found a good muffin (yuck to Au Bon Pain, delis and street carts) until I went to Financier today. I think it’s the perfect size, too. For dougnuts, Dunkin Donuts tastes unnatural, and I had an unimpressive cider doughnut from one of the farmer stands. I really like Financier’s scone. My other favorites are from Levain Bakery and Alice’s Teacup, but the tastiness depends a lot on the freshness. Mraah! about donuts – especially from Donut Planet. Rugelach is hard to find; after trying a few brands from Zabar’s and Fairway, I’ve been pretty disappointed but it’s a task I’ll try to take. I’m more of a babka girl than a rugelach. Robyn – I totally agree with you about the scone’s tastiness depends on the freshness. But it also depends on their recipe some of them are just plain horrible (i.e. Bread Alone) I bought at 8 AM and it’s just plain awful! Hi Tina, I just saw Ed’s post. I’m not a fan of Doughnut Plant’s raised doughnuts, but maybe I’ll give the tres leches and Balthazar doughnut a try. About rugelach-darn, I heard Zabar’s was good. Sorry you had bad results. I’ve also heard good things about Margaret Palca Bakes. I saw some at Sahadi’s in Brooklyn but didn’t get them because they didn’t have chocolate. I love babka too! Ooh, what are your favorites? Do you know why some are more bready and others are like danish? What’s the difference between babka and Russian coffee cake? Zabar’s sells both. 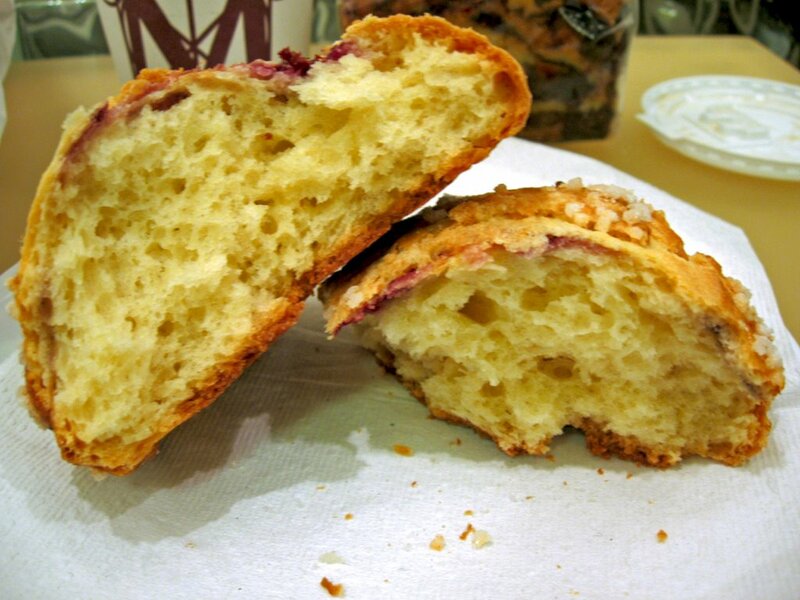 Jessica – To tell you the truth, I don’t know what’s the difference between a babka and a Russian coffeecake. But I heard that there’s different schools of babkas like Russian and Polish. Even though I’m a bit ignorant about Jewish and Eastern European food and desserts, I still do love both. My favorite brands are either Green’s or Eli Zabar’s, both of which I purchase from Zabar’s once every two to three weeks. Went to Alice’s Tea Cup and seriously, my pumpkin scone was AMAZING. Best scone I ever tasted in my life. Realized that I’ve been missing out.